Once a day, you woke up, and found yourself in a maze with an electronic heart instead of the natural one, then, a robot comes to you and tells you have been put into tests, you have to finish each level to recharge your heart before it runs out of power. This is my first Ludum Dare Jam game ever, I had some problems managing my time, and here's what I came with. Down, X: Interact, drop and pick crates. 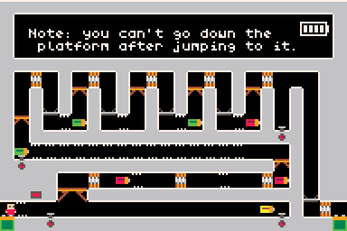 C: The "Start" button, to respawn in the game. 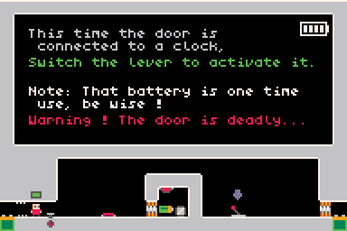 You can change the default controls by pressing `K` in the main menu. 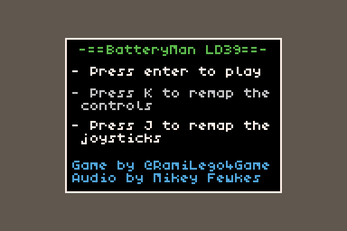 It's also possible to use a joystick, be sure to remap it's buttons by pressing `J` in the main menu. 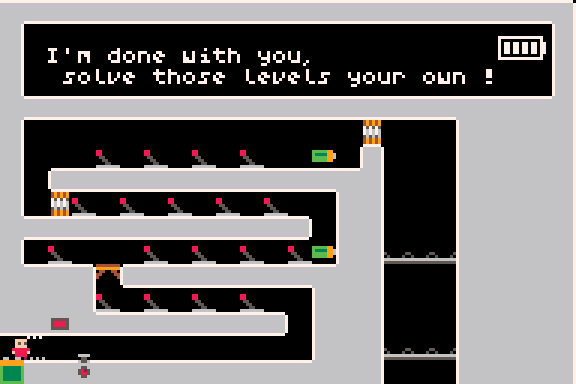 Game and Levels: By Rami Sabbagh (@RamiLego4Game). Sounds and Music: By Mikey Fewkes. Bugfix crates can't be taken if you died with a one already picked. Bugfix some of the hard jumps in the maze level. Bugfix the touch dpad not responding unit you move the touch. 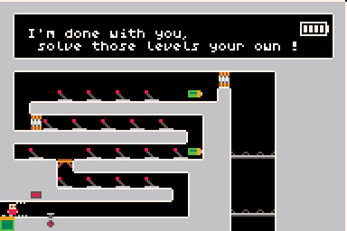 You can now press "delete" to quit into the terminal. The game has been made using LIKO-12, an opensource fantasy computer made using the LÖVE framework, and actually it's using a modified version that has Audio support, it loads the wav and ogg files in the Audio folder, give them ids, and then in the game I call "Music(id)", "SFX(id)" and "StopAudio()", I will write a devblog soon telling about all the modifications I made while creating this game. Note: Android build coming soon ! 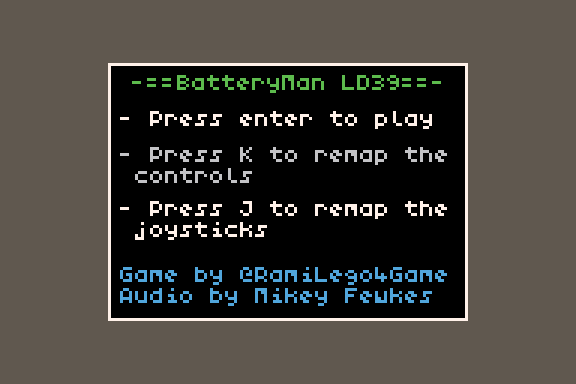 Download, extract and run BatteryMan.exe. Download, extract and run "run.sh"
Download the .love file, install "LÖVE for Android" from the google play, use a file explorer like "ES File Manager" to open the .love file using LÖVE for Android.